John Zappia celebrates 23 years of sportsman drag racing this year, grounded in hard work, innovative engineering and wild driving that has earnt him cult status in Australia, and numerous World Records in the process. This week Zap formally announces his move to full time professional drag racing status in Australia due to new agreements secured with naming rights sponsors Striker Crushing and Screening, who have substantially increased their involvement in the team and drag racing. Zappia Racing will move out of the “back garage” at Zap’s home to brand new state of the art premises in Perth Western Australia, where the team will expand to a two car Top Doorslammer team and build a solid foundation for their professional and business endeavours of the future. The World Record holding Zap’s Rat HQ Monaro will be duplicated, and licensed by Zap before handing over to rookie Top Doorslammer driver Craig Pedley, owner of Striker Crushing and Screening. Striker Crushing and Screening are a manufacturer of large mining equipment, and have enjoyed significant success in business internationally. The recent resources boom in Western Australia has contributed to the success, and given the company the opportunity to support a local hero in John Zappia, and help realise some personal dreams for the Directors in the process. 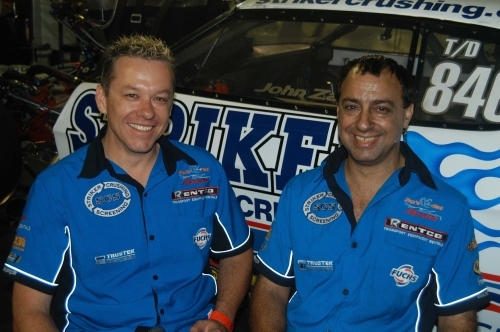 Zappia Racing have commissioned Sydney chassis builder Craig Burns of SCF Race Cars to build the chassis of the second HQ Top Doorslammer, after Zap visited their premises during racing at WSID this season. Craig is new to Top Doorslammer chassis building, but has experience building and setting up some hard hitting six second new technology cars in Australia, and has a solid knowledge of Doorslammer setups that aligns with Zap’s chassis development knowledge gained in association with Santhuff. The chassis will be sent back to the new Zappia Racing premises in Perth, where a new carbon fibre body developed with the assistance of local aviation sponsors will be fitted, then all the trademark Zappia Racing technology will be fitted. “The new car will be identical to the old both mechanically and in body shape, but with carbon fibre composite materials. We are proud of our tin top body, but it took a lot of work to produce, and is difficult to reproduce and repair. We expect the new car to be a five second car as well, and will eventually be very competitive in the Australian Top Doorslammer Championship” said Zap. The new developments mark the second major step in John Zappia’s drag racing career, after Rentco Transport Equipment Rentals Pty Ltd Managing Director Bob Shier came on as Naming Rights Sponsors in Feb 2005 helping launch Zap’s Rat into the National Australian Top Doorslammer Championship. Rentco continues to support Zappia Racing with their Major Sponsorship package. Zappia Racing are currently developing a range of new sponsorship packages to take advantage of the two car team, and recently released television coverage plans for next season by the Australian Drag Racing Association and other stakeholders in Australian drag racing. Photo courtesy of Torque Photos.